Don't just make your short films -- get them seen by the world! The whole reason we created MFSF is because we love film, and we want to encourage the next generation of filmmakers. That's why we're proud to present two great opportunities for students to get their work seen! New for 2008! 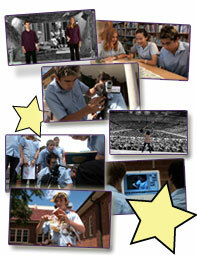 Fantasticoff is the brand-new online film festival for schools and individuals using Making Fantastic Short Films. Judging of the entries is done by your school! Fantasticoff includes several categories and an assortment of prizes for different subject areas (such as History, Foreign Language, and Science), as well as awards for the best short films using the Story template, and even most creative use of the school. Your school will be entitled to ONE JUDGE for every MFSF copy ordered by your school. Order your copy of MFSF today to ensure your voice is heard at this year's festival! Details are coming soon to www.FANTASTICOFF.com! Get your school involved today! The producer/director of MFSF is also the co-founder of New Zealand's Big Mountain Short Film Festival, which has a special Schools Competition as part of the festival weekend. Entry to Big Mountain is free, and full details are on the Big Mountain Short Film Festival website. So don't delay! Get busy making FANTASTIC short films today!